Bonita Melody Lysette "Bonnie" Langford (born 22 July 1964) appeared as the Doctor's companion Mel, debuting in Terror of the Vervoids, one of the stories in The Trial of a Time Lord, and departing at the conclusion of Dragonfire. She has since reprised the role in several audio dramas for Big Finish Productions. She first achieved fame as a child actor, starring in the television series Just William and the film Bugsy Malone. 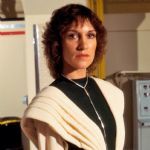 IMDB: Click Here Jan Chappell was born in 1949 in the UK. She is an actress, known for Blake's 7 (1978), Basic Instinct 2 (2006) and Performance (1992). Imbd: click here Sophie Aldred is an English actress and television presenter. She portrayed the Doctor's companion Ace in the television series Doctor Who during the late 1980s. Aldred was born in Greenwich, London, but grew up in nearby Blackheath. She sang in the church choir of St James', Kidbrooke and attended Blackheath High School from 1973 until 1980, before enrolling as a drama student at University of Manchester. She graduated in 1983 and decided to embark on a career in children's theatre. She also sang in working men's clubs around Manchester. François Pandolfo is an actor, known for The Rezort (2015), Coward (2017) and Doctor Who (2005). EastEnders. Special Skills & interests: Italian (conversational); BADC stage combat: (foundation) Poetry; photography; physical theatre; contemporary dance. Recent film credits include 'Rogue One A Star Wars Story', the Oscar nominated '45 Years' 'Sherlock Holmes; A Game Of Shadows', 'The Theory Of Everything', 'Burnt' with Bradley Cooper directed by John Wells. Please note: Richard will not be available as part of any '5 for 4' deals on the day. Colin J. Spaull (born 19 May 1944) is a British actor, noted for his television work. His credits include: Z-Cars (in which he played three characters between 1964 and 1969), Dixon of Dock Green, Doctor Who (in the stories Revelation of the Daleks, "Rise of the Cybermen" and "The Age of Steel"), Boon, Goodnight Sweetheart, Inspector Morse, The Bill (in which he has played seven characters between 1985 and 2003), Casualty and Holby City. Recently, he appeared in one episode of The Inbetweeners as Roy, Will's neighbour. Please note: Colin will not be available as part of any '5 for 4' deals on the day. Caroline Munro was born in Windsor and lived in Rottingdean near Brighton where she attended a Catholic Convent School. By chance, her mother and a photographer entered her picture in a "Face of the Year" competition for the British newspaper The Evening News and won. This led to modeling chores, her first job being for Vogue Magazine at age 17. She moved to London to pursue top modeling jobs and became a major cover girl for fashion and television commercials while there. Parts came her way in such films as Casino Royale (1967) and Where's Jack? (1969). One of her many gorgeous photo ads earned her a screen test and a one-year contract at Paramount where she won the role of Richard Widmark's daughter in the comedy/western A Talent for Loving (1969). Also in 1969, she became the commercial poster girl for "Lamb's Navy Rum", a gig that lasted ten years. Vincent Price's dead wife in The Abominable Dr. Phibes (1971) and Dr. Phibes Rises Again (1972) which, in turn, led to a Hammer Studios contract and such low-budget spine-tinglers as Dracula A.D. 1972 (1972) and Captain Kronos - Vampire Hunter (1974). More noticeable roles came outside the studio as the slave girl/love interest in The Golden Voyage of Sinbad (1973), the princess in At the Earth's Core (1976), and a lethal Bond girl in the top-notch The Spy Who Loved Me (1977), one of Roger Moore's best outings in the '007' series. By the late 1970s, she was in Starcrash (1978), Maniac (1980) and Slaughter High (1986). Please note: Caroline will not be available as part of any '5 for 4' deals on the day.